No matter the season or the setting, this thoroughly satisfying dessert hits the spot. The serving size is intentionally small – all the better to savor the intense hit of chocolate. I like to serve this with chocolate sorbet alongside, also embellished with a touch of crunchy chocolate nibs. A double boiler; a baster; eight 1/4-cup (65 ml) vodka or shot glasses. What are nibs? Cacao nibs are pieces of cacao beans that have been roasted and hulled. Nibs taste faintly similar to roasted coffee beans. They have a great crunch, a slightly nutty flavor, and a pleasant touch of bitterness. The custards can be prepared up to 3 days in advance, covered and refrigerated. I love to serve this treat with the chocolate-friendly, sweet Banyuls reserve wine from Domaine La Tour Vieille in the Languedoc. With its touch of spice, hint of chocolate and overtones of raspberry, what could be a finer partner for a chocolate dessert? Rhubarb – still known as “pie plant” – always reminds me of my childhood, because wherever we lived my mother was sure to plant rhubarb in the vegetable garden, ensuring a steady supply of this tangy vegetable for pies as well as sauces for spooning over vanilla ice cream. But rhubarb can be visually problematic, often losing its gorgeous rub red color as it cooks. I think that I have found a solution: in these delectable bars the rhubarb is not precooked – it is cut into extra-thin slices so it cooks quickly as the bars bake, retaining its bright red color. A 9 1/2 x 9 1/2-inch (24 cm) square baking pan; baking parchment; a food processor. In our tests, we found best results with Lindt Excellence 70%, a chocolate, which is readily available at supermarkets. Be cautious about using just any chocolate; in chocolate with less than 70% cacao the final result will not always be firm enough. Raw eggs are used in this preparation. Consuming raw eggs may increase the risk of foodborne illness. Raw eggs should be avoided by the very young and the very old, pregnant women, and anyone with a compromised immune system. We have multiple varieties of fig trees on our property in Provence, and from June to October they offer an abundance of sweet fruits, some vibrant green, some green tinged with purple, and some almost black. My favorite variety is the small and delightfully sweet Ronde de Bordeaux, an ideal fig for tarts and jams. A 10-inch (25 cm) tart pan with a removable bottom; a rolling pin; a baking sheet lined with baking parchment; a blender or a food processor. In our tests, we have preferred Dufour brand frozen puff pastry, available at most specialty supermarkets. See www.dufourpastrykitchens.com. Be sure to leave ample time for thawing frozen dough, at least 6 hours in the refrigerator. 5. 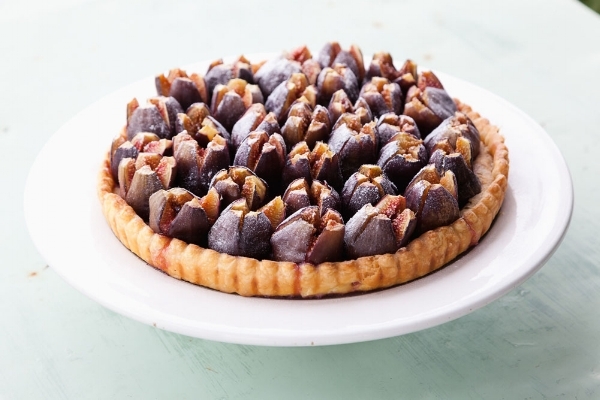 Return the tart pan to the oven and bake until the figs and the filling are dark and bubbly, 20 to 25 minutes. Remove from the oven and transfer to a rack to cool. While the tart is still warm, sprinkle with confectioners’ sugar. After about 10 minutes, carefully remove the tart from the sides of the pan, leaving it on the pan base. Serve warm or at room temperature, cut into wedges, with Roasted Fig Sorbet. This tart is best served the day it is baked. The secret: Ripe, but not overly ripe figs, which tend to give up too much liquid and turn the pastry soggy. Tip: Figs freeze beautifully. Treat them as you would berries: Arrange the whole fruit stem side up, side by side on a baking sheet, and place in the freezer. Once frozen, transfer to a zippered plastic bag and freeze for up to 3 months. For use, thaw at room temperature. I have rarely seen students so enthused and bursting with pride as their airy brioche puffs to grandeur in the oven, arriving shiny and golden to the table just moments later. There is great triumph in baking perfection, and after a class, e-mails, photos, tweets and Facebook notations attest to the students prowess in the kitchen. In my kitchen, I use honey rather than sugar as a sweetener. The reasons are simple, honey just makes food taste better and for us it’s a homegrown product, produced from our bees that call Chanteduc and Provence home. When preparing this brioche, don’t omit the saffron: Infusing it in the warm milk dramatizes the intensity of these golden threads and adds an exotic flavor and aroma to the final product, not to mention the touch of color. A heavy-duty mixer fitted with a flat paddle; a dough scraper; two nonstick 1-quart (1 l) rectangular bread pans. 7. After the second rise, the dough is ready to use. 8. To bake the brioche: Divide the dough into 12 equal pieces, each weighing about 2 1/2 ounces (75 g). Roll each piece of dough tightly into a ball and place 6 pieces side by side in each bread pan. Cover the pans with a clean cloth and let the dough rise at room temperature until doubled in bulk, 1 to 1 1/2 hours. 9. Center a rack in the oven. Preheat the oven to 375°F (190°C). 10.Lightly brush the dough with the beaten egg. Working quickly, use the tip of a pair of sharp scissors to snip several crosses along the top of each pan of dough. (This will help the brioche rise evenly as it bakes). Place the pans in the oven and bake until the brioche loaves are puffed and deeply golden, 30 to 35 minutes. Remove the pans from the oven and place on a rack to cool. Turn the loaves out once they have cooled. Top-quality honey makes all the difference here. Honey not only enriches the flavor of this brioche, but also helps keep it moist. The brioche is best eaten the day it is baked. It can be stored for a day or two, tightly wrapped. To freeze, wrap it tightly and store for up to 1 month. Thaw, still wrapped, at room temperature. This is a gluten-free version of my classic Chestnut Honey Squares that I have been making for years, always to rave reviews from my students and friends. Here, fresh ginger and candied ginger team up to make an uplifting, zesty treat that can be prepared in any season. 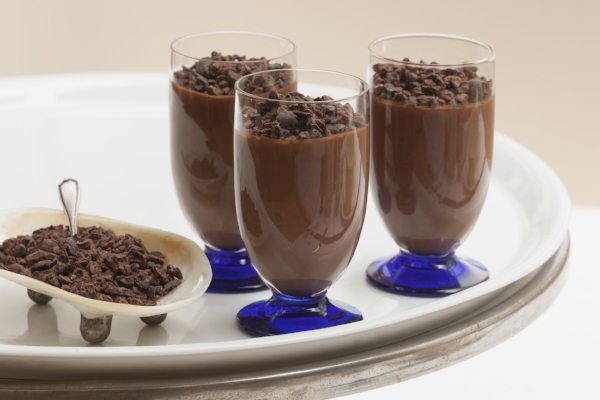 This quick yet impressive dessert lends itself to endless reincarnations, using various dried fruits and citrus zests, even a cocoa version for chocolate lovers! A 9 1/2 x 9 1/2-inch ( 24 cm) square baking pan; baking parchment; a 2-quart (2 l) saucepan; a baking rack. 2. Prepare the base: In the saucepan, melt the butter. Add the almond meal, fresh ginger, honey, egg, salt, and vanilla extract. Stir until well combined. The mixture should be thick and sticky. 3. Turn the mixture out into the prepared pan. To help make a level and even pastry, place a piece of plastic wrap on top of the pastry. Using a flat-bottomed glass (or your fingers), smooth out the base by pressing gently to evenly cover the bottom of the pan. Remove and discard the plastic wrap. Bake until the pastry is slightly firm, 12 to 15 minutes. 4. Meanwhile, prepare the topping: In the same saucepan, melt the butter over low heat. Add the almonds, candied ginger, honey, salt, and vanilla. Stir just until the ingredients are incorporated. 5. Once the base is baked, spread the topping evenly over the base and bake until the topping is a dark and sizzling, 12 to 15 minutes. Do not underbake. 6. Transfer the pan to a rack to cool in the pan. When the dessert is completely cool, remove it from the pan using the overhanging parchment as handles and cut it into 16 even squares. Serve with fresh thyme or rosemary sorbet. A 9 1/2 x 9 1/2-inch ( 24 x 24 cm) baking pan; baking parchment; a food processor. 3. Prepare the pastry: In the food processor, combine the flour, almond meal, sugar, and salt. Pulse to blend. Add the butter and pulse until the mixture resembles coarse crumbs. Add the egg yolk, vanilla, and 1 tablespoon of water. Pulse to incorporate. Add 2 to 3 tablespoons of water, tablespoon by tablespoon, through the feed tube, pulsing until just before the pastry forms a ball. You may not need all the water. 4. Turn the dough out into the prepared baking pan. Press the dough evenly into the bottom of the pan. Place in the oven and bake until the pastry begins to brown around the edges, 12 to 15 minutes. 5. While the pastry is baking, prepare the topping: In a saucepan, melt the butter over low heat. If using a vanilla bean, use a small spoon to scrape out the seeds. Add the seeds to the melted butter. Dry the vanilla bean at room temperature, then place in a jar with sugar to make vanilla sugar. Seal the jar. Add the almonds, candied peel, sugar, honey, and, if using, the vanilla extract. Heat just until the ingredients are incorporated. 6. 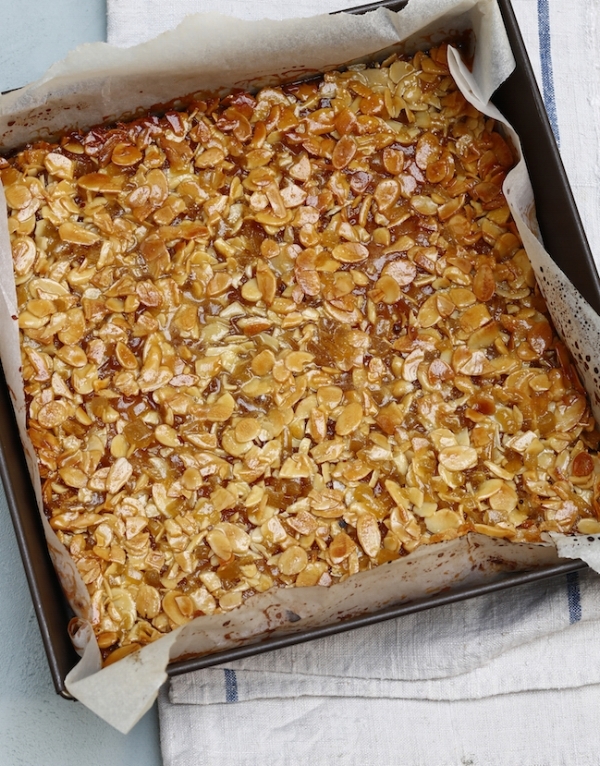 Remove the pan from the oven and spread the almond-honey mixture evenly over the pastry. Return the pan to the oven and bake until the topping is a deep gold, 12 to 15 minutes. 7. Remove from the oven. Transfer to a rack to cool in the pan. Once it has cooled remove from the pan and cut into 32 squares. (Store in an airtight container at room temperature for up to 3 days). Substitute dried black currants for the candied citrus.